Growing climate disruption makes it increasingly clear that the old ideas about leadership aren’t working. When the worst drought in 500 years strikes California, England endures the wettest winter in 250 years, and an historic heat wave sets off a rash of bushfires in Australia all at the same time, the weaknesses inherent in traditional notions of the “leader-as-hero” become all too apparent. 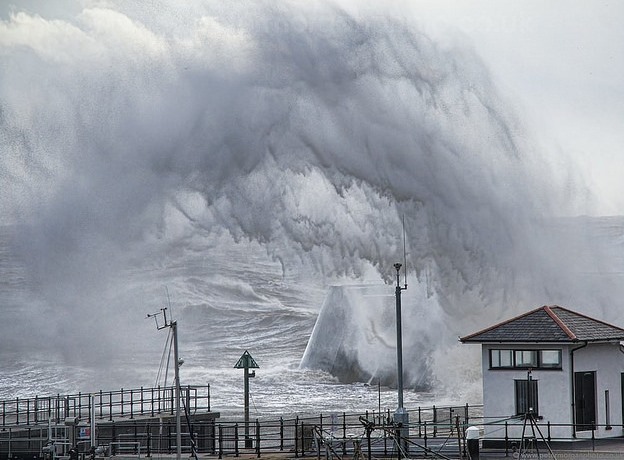 Winter storm batters the coast of England in early February. Since it was first launched in 2008, TCCPI has sought to demonstrate what this kind of collaboration looks like and the impact it can have on a region’s economic, social, and environmental health. But it is only one among many such efforts in our community. A terrific example of collaborative leadership can be found on South Hill, where Ithaca College, PPM Homes, Cornell Cooperative Extension-Tompkins County, and the South Hill Civic Association have joined hands to raise student awareness about the importance of energy conservation. Energy efficiency in rental properties is notoriously difficult to achieve in part because of the problem of “split incentives.” Often landlords don’t make efficiency investments because it’s the renters who pay the energy bills. In cases where the landlord pays the utilities, the tenant has little financial incentive to practice energy conservation. The result is housing that wastes energy and costs more than it should. Unless the different stakeholders come together and work out a solution that makes sense to everyone, the status quo prevails. In a community like Ithaca where 73% of the housing market consists of rental properties, split incentives pose a significant challenge to attempts to reduce the city’s carbon footprint. As a result of the South Hill collaborative process, PPM Homes carried out extensive upgrades to make its rental properties more energy efficient and provided free bus passes to encourage less reiiance on automobiles. At the same time, the process brought students into the conversation, helping them understand their role as tenants in improving energy conservation. Ithaca College, Cooperative Extension, and the South Hill Civic Association all reinforced this effort, working to heighten the students’ sense of responsibility to the community at large. As the South Hill experiment underscores, collective efforts involving “leaders-as-hosts” draw together key stakeholders and engage them in a course of action that begins with discovering and making explicit common intention and ends with collectively creating the kinds of innovation needed to effectively address difficult problems. Such cooperative ventures provide a framework for multisector collaboration that helps to light the path ahead.